The leaders of Tanzania’s ruling Chama cha Mageuzi (CCM) party must have been worried last October, in the face of what many expected to be a greatly strengthened opposition. There was the possibility that it might face defeat on election day – October 25. They must be happy with the results (which are given below). The main opposition party CHADEMA had acquired a new and dynamic leader, Edward Lowassa, a former CCM Prime Minister under President Kikwete. Further, the party had joined with three other parties to form a coalition, called UKAWA (Umoja wa Katiba ya Wananchi) or ‘Coalition of Defenders of the People’s Constitution’, which promised to present a strong challenge, and which had access to sufficient resources to run a formidable campaign. UKAWA must have been disappointed by the results and Lowassa refused initially to accept them. (Details of what happened in the period leading up to the elections were given in Tanzanian Affairs No 112). In fact, the elections turned out to be peaceful and the management by the National Electoral Commission (NEC) was generally good. In Zanzibar, the elections were also well managed but, as is usual in the Isles, the actions of the Zanzibar Electoral Commission (ZEC) described below, raised many questions. 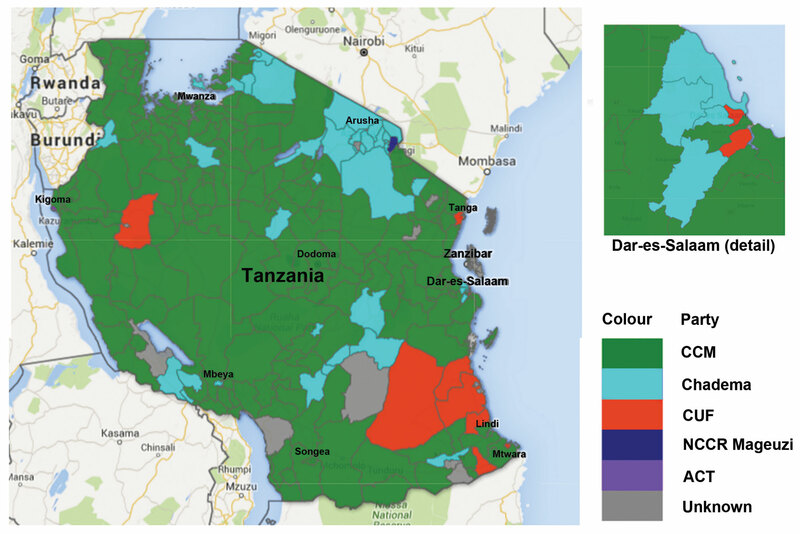 A leading article about the elections in The East African, which is still banned in Tanzania, described Tanzania as still the most stable and peaceful country in an otherwise turbulent region. The paper looked forward to a smooth transition of the kind that had been the hallmark of Tanzanian politics for many years. 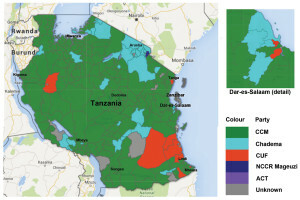 *Based on data from http://www.parliament.go.tz/ and http://www.ipu.org/. Numbers do not include the 110 special seats (women) and MPs nominated by the President which brings the total number of MPs to over 370. Senior Researcher in the Africa Research Institute Nick Branson has produced a paper, which first appeared on the Institute’s blog in November 2015. It analyses the results and gives details from the main cities and regions. ‘United behind a common cause, and boasting a harmonised list of candidates UKAWA was able to compete in urban constituencies where CCM had hitherto been able to profit from a divided opposition. ‘The opposition exceeded expectations in Dar es Salaam, where its MPs now outnumber those from CCM. CHADEMA retained its seats in Ubongo and Kawe, won the new constituency of Kibamba, and took Ukonga from CCM. CUF candidates ousted CCM incumbents in Kinondoni and Temeke. CCM won only four of the ten seats in the city: Ilala, Kigamboni, Segerea and Mbagala. ‘Uniting behind the opposition presidential candidate, Edward Lowassa, who is from the Northern Zone, enabled CHADEMA to win a swathe of seats across Arusha, Kilimanjaro and Manyara regions. The opposition Civic United Front (CUF) a mainly Zanzibar party secured the constituency of Tanga Urban and control of Tanga District Council on the Tanzanian mainland. ‘Yet, opposition advances were cancelled out by Magufuli’s popularity in his native Lake Zone, limiting CHADEMA’s gains in Mara and Shinyanga regions. Mwanza, Tanzania’s second city, where he used to work as a chemist and teacher, remains in the hands of the ruling party. ‘The opposition failed to challenge CCM hegemony of the rural Central Zone, with the exception of one seat in Tabora, won by CUF, and two falling to the opposition in Kigoma. ‘However, remarkable progress was made in the Southern Highlands, where CHADEMA won four parliamentary seats in Mbeya and one in Iringa region, in addition to taking control of the Mbeya and Iringa town councils. ‘The Coast Zone also saw opposition gains: CHADEMA took five seats in Morogoro region; CUF took four in Lindi region; and both parties secured MPs in Mtwara. In the hotly contested Bukoba Urban seat Wilfred Lawakatare (CHADEMA) beat the previous MP Khamis Kagasheki (CCM) by almost 10%. The candidate for Vunjo, (Moshi) James Mbatia, leader of the small NCCR – Mageuzi party, won the seat easily with 60,187 votes. The CCM candidate obtained 16,617 and the one time very famous politician Augustine Mrema 6,416. In spite of this result Mrema filed a petition at the Moshi High Court to challenge the results. He said he ‘wanted justice’. The result in the Serengeti constituency was an unexpected setback for CCM. Many observers felt that the previous MP Dr Stephen Kebwe ran a poor campaign. He got only 5,980 votes compared with the 9,268 for CHADEMA. The ambitious leader of the new ACT – Wazalendo party, Zitto Kabwe MP, who was also Chairman of the influential Public Accounts Committee in the previous National Assembly and gained fame for his attacks on corruption, did well. He got 31,546 votes in his Kigoma Central constituency compared with 17,344 for CCM and 12,077 for CHADEMA. But he will be a lonely voice in parliament, as he was the only one of the ACT party candidates to win election. Kabwe said that he would support President Magufuli on the corruption issue. “Why should we oppose him?” he asked. Branson’s paper goes on: ‘An influx of new legislators – with 40% female representation – will make the eleventh parliament the most representative and dynamic yet. This should provide constituents with a new opportunity to raise hitherto neglected grievances and ensure the proper scrutiny of legislation. However, an increased opposition presence in the chamber will also renew calls for debate over the country’s constitutional settlement’. The election campaign was unlike earlier campaigns because of the widespread use of new technology. All parties and their members have made great use of social media which has been a powerful influence to complement the traditional posters, newspapers, radio and television advertisements. All parties and their members were wooing voters on Facebook, Twitter, Instagram and WhatsApp. A CHADEMA spokesman was quoted as saying that his party were employing every technology at its disposal to detect, stop or otherwise curtail vote-rigging. About 75% of the 48 million population have access to mobile phones and it is estimated that Tanzania has about nine million internet users, thanks to the technological revolution fueled by fibre-optic cable and the substantial decline in the cost of using the internet. After the results were announced Lowassa refused to recognise the victory of Magufuli. He said: “I have lost the battle but not the war”. He added that he would remain in active politics after losing the elections which he said had been rigged. However, in view of the size of the victory of Dr Magufuli, most Tanzanians appeared to accept that he did win. During the campaign the candidates promised many things. Among them that hawkers would be free to display their wares wherever they chose, small traders would have unlimited access to loans and education would be free. Lowassa promised that petty traders and motorcycle taxi operators would not be harassed by the police. Dr Magufuli added women food vendors to this list. He also promised TSh 50 million to every village for lending to entrepreneurs. Lowassa would reduce income tax. He also promised to form a committee to resolve conflicts between pastoralists and farmers. He would have a removal of traffic jams in the capital and have electricity and piped water across the country. The predominant word during the election was ‘CHANGE’, used by all parties. The opposition coalition of CHADEMA, CUF, NCCR – Mageuzi and the National League for Democracy (NLD) largely held together during the campaign as parties negotiated about the actual seats in which they would be allowed to stand. Under new rules, the presidential results published by the Electoral Commissions on the mainland and Zanzibar would be final and no challenges would be allowed in the courts. During the campaign several well-known members of the CCM party defected to the opposition group of parties in UKAWA. They included the party’s ideological guru Kingunge Ngombale-Mwiru, former Prime Minister Frederick Sumaye, Hassan Moyo who was prominently involved in the 1964 Zanzibar revolution, Lawrence Masha, a former home affairs minister, and a former Secretary-General of the East African Commission, Juma Mwapachu. In most cases, these defections were seen as linked to Lowassa’s decision to leave CCM and join CHADEMA. During the final stages of the election count the police raided and seized 24 computers from an office used by the ‘Tanzanian Civil Society Consortium on Election Observation’. They also arrested 36 data clerks at the centre. They suspected the centre was collecting, tallying and distributing election results to the public, contrary to a recently passed law. After five hours the personnel were released but the equipment remained in the possession of the Police. The police also entered a CHADEMA election data centre and arrested 166 people, in connection with unlawful posting to the social media network of unverified election results’ contrary to new regulations. The police said that they were trying to establish the motivation behind their action, who the results were for, who paid for them and what they wanted to do with the results in future. The police said that, if mishandled, the figures could result in a breach of the peace if they were different from those published officially. At a big ceremony in the Uhuru Stadium in Dar es Salaam, former President Kikwete arrived in a State House open car, waving from right to left to applause across the stadium. He received a 21-gun salute before inspecting his last guard of honour as Head of State. 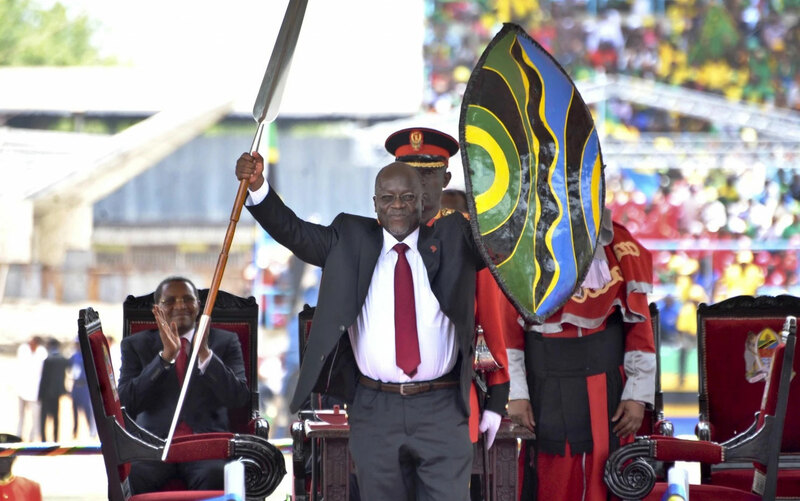 Deafening cheers greeted him as he proceeded to the dais to witness the swearing in of Dr Magufuli and Vice President-elect Samia Hassan Suluhu from Zanzibar, both of whom took their oaths of office before Chief Justice Mohammed Othman. Dr Magufuli took the oath and was then presented with the country’s Constitution before sitting on a traditional stool and being presented with a shield and spear. 53% of all registered voters in the election were women compared with 48% in 2010. However, women made up only 19% of those nominated by their parties as candidates. This is one of the reasons why in Tanzania a number of special seats are allocated in parliament for persons nominated by their parties in numbers proportional to the number of seats they have won in parliament.